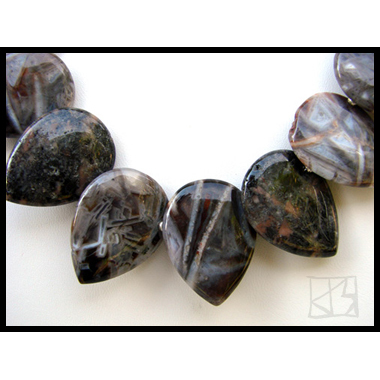 Shaped like dark and mysterious petals of shiny nevada needle agate, these luxurious stones (22x30mm) overlap, separated by sterling silver beads. 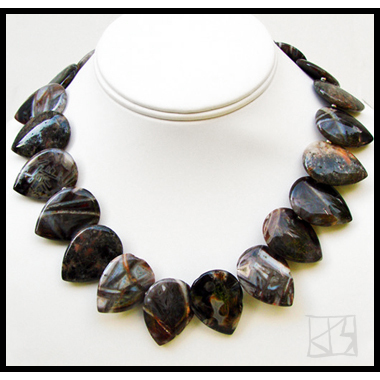 This elegant necklace speaks volumes about the wearer � you! I handpick my strands and then carefully choose each bead from among them for every piece I create... color matching, flow of patterns is essential to my designs. My hope is that you recognize and appreciate this as the most attractive quality of my work.